The DVD player is a high performance unit designed to be used in a variety of setups. It has a plentiful variety of video output (composite, S-video, Component, HDMI) and audio output (analog RCA, digital optical, and digital coaxial) capabilities. However, there is one thing manufacturers didn't account for: the increasing demand for DVD players to be able to connect to a standard cable or antenna input on older (1970s, 1980s) or entry level TVs (13 inch models from 1990s) which do not have analog RCA audio/video input jacks. Do you only have a single connection option, the coaxial cable input jack on your TV? If you have tried to connect your DVD player into your VCR and then use the VCR to pass the signal to your TV, but have experienced very poor picture quality in doing this, the reason is that a DVD player cannot be connected to a TV in this fashion due to the fact that DVDs are encoded with anti-copy technology that interferes with the VCR's circuitry. That is why you cannot make a copy of a DVD onto a VCR tape successfully without using external electronic gear. However, in most cases, this also prevents you from using the VCR as a "conduit" to pass a DVD signal through to the TV. So, what is a person to do? Many people have their antenna or cable connected to the VCR and, from there, the VCR is connected to their TV. However, how can you connect a DVD player to your TV, if your TV doesn't have A/V inputs that are compatible with the DVD player? Secondly, how can you connect both your VCR and DVD player to your TV at the same time if your TV only has one cable or antenna input? The answer to the above questions is a little box that has been around for years called an RF modulator (Radio Frequency Modulator). The function of an RF modulator is simple. The RF modulator converts the video (and/or audio) output of a DVD player (or camcorder or video game) into a channel 3 or 4 signal that is compatible with a TV's cable or antenna input. There are many RF modulators available, but all function in a similar fashion. 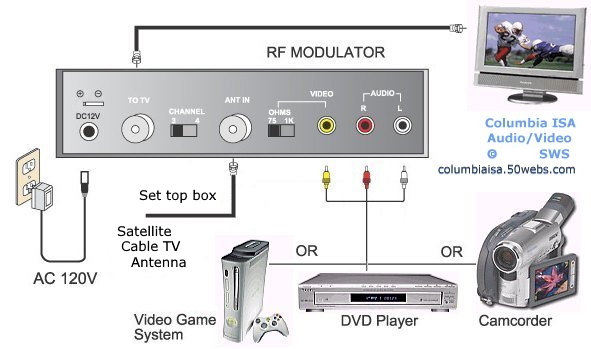 The main feature of an RF modulator is the capacity for it to accept the standard audio/video outputs of a DVD player and the cable TV input (even passed through a VCR) simultaneously. The RF modulator box typically uses AC power, so you will need an outlet. 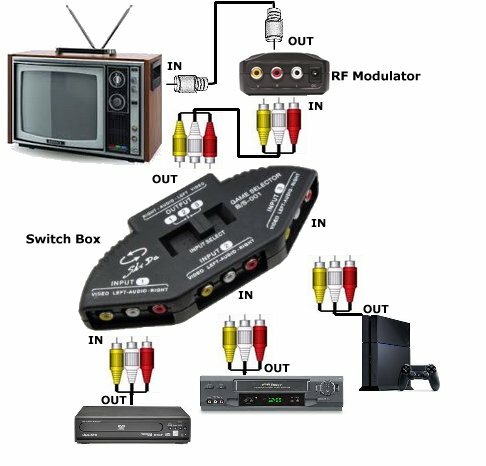 First, plug your cable TV/VCR output into the cable input connection (ANT IN) of the RF modulator and then the DVD player's 3 RCA A/V cables (yellow, red, white) into the RF modulator's A/V inputs (yellow, red, white). Second, connect a standard RF coax cable from the RF modulator OUT (TO TV) to your TV antenna/VHF IN jack. Third, select either channel 3 or 4 output on the back of the RF modulator. This is a two position switch. Fourth, turn the TV on and the RF modulator will automatically detect your cable input for the TV. When you want to watch your DVD player, just put the TV on channel 3 or 4, whichever one you selected on the RF mod box, turn the DVD player on and the RF modulator will automatically detect the DVD player and will display your movie. Although there are minor differences in brands of RF modulators, the set up is basically as outline above. In addition, if you don't have a stereo system you can also hookup the DVD player's stereo outputs to the RF modulator as well, obviously you won't get the benefits of surround sound, but you will hear the audio through the TV's speakers. Also, you won't get the full benefits of a DVD quality picture as the conversion from video to RF (cable) downgrades the resolution, however, as you switch between your VCR and DVD you will notice the quality of the DVD image is still superior than anything you probably have viewed on your TV. RF Modulator / Video Switch boxes: You can also get an RF modulator box which allows multiple inputs. Some will even automatically switch to whichever device is "active" or powered on. This way you can hookup game consoles and DVD players etc. without unplugging cables every time. 4 Device Switchable Audio/ Video RF Modulator - Connect up to 4 devices such as DVD Player, VCR, Video Game Systems, etc. and view them on any TV on channel 3 or 4. Allows you to watch DVD and Camcorder movies on TVs without audio/video input jacks. Just connect your DVD player or camcorder to the box and tune your TV to channel 3 or 4. Three device connections on back plus 1 convenient front panel device connection. Includes plug-in AC power supply. Upgrades older TVs for use with newer Audio/Video components. Front input for convenient camcorder or video game connection. Automatically switches between video source and cable/Sat/antenna signal. RF Modulators allow video components such as DVD players, video game systems, VCRs and camcorders to be viewed on televisions that are not equipped with an available audio/video jack. RF Modulators are the ideal way to connect multiple components to any television, making it easy for everyone in the family to enjoy their favorite movies, video games and other video sources anytime. Just connect your source components and select channel 3 or 4 as the output. There is no longer a need to move components around and disconnect and reconnect wires. for picture of cable connections. See the hookup diagrams below. RF modulator boxes are available at electronics and major retail stores or online for around $20. Converts up to four Audio/Video source inputs (DVD, VCR, Camcorders, video game systems, etc.) to VHF for viewing on any TV.